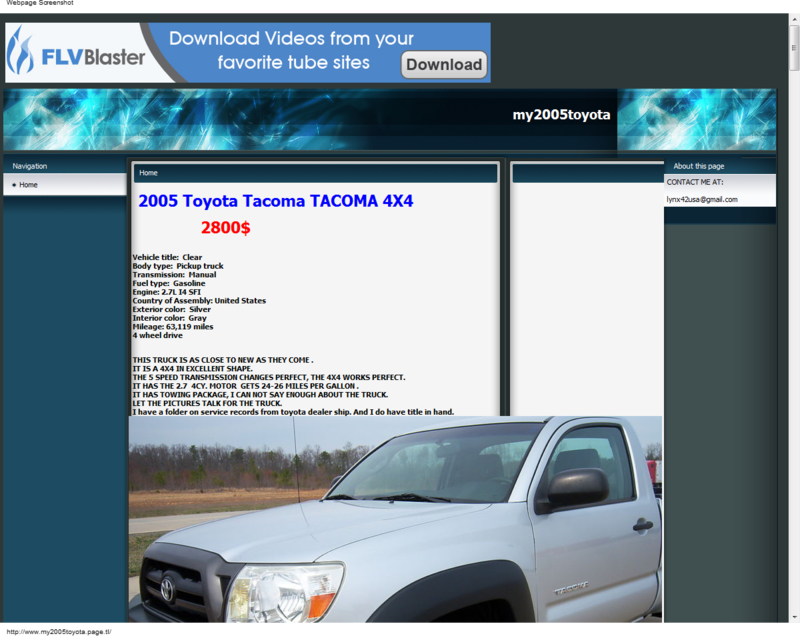 The scammer is advertising a 2005 Toyota Tacoma TACOMA 4X4 for 2800$. and asking for payments to the United Kingdom using Western Union. THIS TRUCK IS AS CLOSE TO NEW AS THEY COME . IT IS A 4X4 IN EXCELLENT SHAPE. THE 5 SPEED TRANSMISSION CHANGES PERFECT, THE 4X4 WORKS PERFECT. IT HAS THE 2.7 4CY. MOTOR GETS 24-26 MILES PER GALLON . IT HAS TOWING PACKAGE, I CAN NOT SAY ENOUGH ABOUT THE TRUCK. LET THE PICTURES TALK FOR THE TRUCK. I have a folder on service records from toyota dealer ship. And I do have title in hand. Please let me know if you can make the payment today or tomorrow because I have another interested buyer and I want to finish the deal this week! I forget to tell you when you will go to the Western Union office if the agent from Western Union will ask you where you send the money you must tell that you send the money to a friend or a relative because if you will tell that you send the money for an online purchase the Western Union will extra charged both of us with 10% from the entire amount which means around 600$! I am not willing to spend some useless money! Also you have to pay a normal transfer fee at Western Union which is around $140! I'm waiting your email after you will made the payment! At the moment I'm stationed in a U.S. air force base in Cambridgeshire, England, making final preparations before deploying to Afghanistan with the U.S. Convoy. The truck is already at our Military Logistic Department from Fort Wayne,U.S. Air Force base in IN, sealed and ready to go. The Logistic Department will deliver the truck to your home. Since the truck is in an air force base, and you can't go there to take it, only the Logistics Department can deliver it, because it's in their custody. Shipping may take anywhere between 1-3 business days depending on the destination. All documents you need for ownership, service book, manuals and bill of sale,the title, will be provided along with the vehicle. For the payment I would like to use Google as a third party. They will keep your money into a protection account until you get the vehicle and will release it to me after inspection period is over and you agree to keep the truck. So, this is not a blind transaction, you can see the truck before committing to buy and to eliminate any concerns you will have 2 days to inspect it. If you decide not to keep it Google will refund you the money, no questions asked, and shipping back will be my concern. I think this is more than fair for both of us. I'll start the official procedure, and Google will contact you about this!!! Again, I want to point out that because I am going to Afghanistan this sale is my top priority and I am looking after a fast transaction, with no delays. That is why I decided to lower the price, to avoid wasting time with negotiations and find a buyer as soon as possible. The price is $2,800 including the delivery fees. 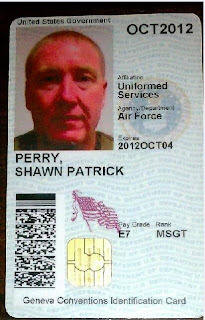 At this moment I am in a U.S. air force base getting ready for Afghanistan. This mean that I do a special training program and I am not allowed to get out of the unit or give calls for the next 2 weeks.The truck is already at our Military Logistic Department sealed and ready for the shipping. The shipping can`t be a problem because I can do it at no cost for you. You will receive the truck along with all the documents including title, bill of sale, full service records and more .Because it is a large transaction we will complete the deal only using an authorized third party like Google Checkout.In this way both of us will be 100% covered during the steps of this transaction.The payment will be handling by Google Checkout and you will benefit of 2 days inspection period (test drive) and the option to accept or reject the truck on my expense. Congratulations! You successfully submited the details for a safe transaction ! Please tell us if you have received the invoice regarding the payment. Once we receive a fax from you with the payment details, we will instruct the seller to start the shipping process. We will hold the payment until you send us confirmation that you are satisfied with the product you have received. As soon as we receive confirmation we will release the payment to the seller. You will receive further details regarding the shipping process (courier information, tracking method, expected delivery date) after the payment confirmation. *NOTE It may occur that your e-mail doesn't support HTML language and that is why you haven't received the invoice from us. Please check your bulk/junk/spam/ messages, the invoice may have ended there because of the ever increasing filters of the e-mails nowadays. Google seller Shawn Patrick Perry has selected Google Checkout to handle a secure online transaction with you. After verifying the membership of this specific member and confirming his overall good standing, we have approved the development of this transaction, based on the seller's purchase protection account on file with Google Safety Department. Currently, the seller has a $5,000 deposit in a purchase protection account from Google Checkout. Transactions with this seller are covered by purchase protection against fraud and description errors. For your safety, the seller's account was locked today, for a 30 days time period. The seller is unable to withdraw any money from it within this period. Due to the fact that the seller is currently unable to make use of his assigned PayPal account, you need to complete the payment by following the instructions provided below. 3 The buyer sends the payment to Google Checkout by fax or e-mail. When payment is received, it will be verified and secured into a non-interest bearing trust account. After payment is secured, the Seller is notified by us to start the shipping process. 4 Buyer receives the product and has 2 days to inspect it. If it is as expected and as what agreed over, the buyer should accept the product. If he refuses the product by any valid reason, the buyer must ship the product back to the seller at the seller's expense within five business days. The carrier will return within five business days. 5 Google Checkoutpays the seller after the product have been received, when the Buyer expresses his/her approval of the purchase, or after the time agreed on, for the Inspection Period, is over - transaction completed. The following item is clear for Google Checkout item insurance policy. Should you need a refund for this transaction, the insured amount will be taken from the seller's purchase protection account and sent to you. The refund is sent to your bank account, by check or money order. The way you are refunded is at your choice. You have 30 days to request a refund. Refund requests are processed within 3 days. The transport will begin as soon as we receive the payment information as instructed below. Should you decline the product, by any reason, you will receive a full refund within 3 business days and no further action is required from your side. Follow these 2 steps. Pay for your item with cash at any local Western Union Office. To complete the payment, you need to go with cash at the nearest Western Union Office in your area and transfer the funds to our Google Agent. The process only takes several minutes, it's easy to deal with and 100% secure. Western Union is the only service that has ultimate authentication of the identity of the funds receiver. Several IDs and utility bills are required before the funds are paid. Therefore, no one else can pick up the money. Your payments cannot be lost in the mail, like money orders or checks. The Locate the nearest Western UnionOffice.Please make the payment with cash using our Google Agent details as the receiver. Click here to find the Western Union agent locations near you. Once the payment transfer cleared and our Google representative confirms the payment, we will instruct the seller to start the shipping process. We will hold the funds until you send us your confirmation that you are satisfied with the product you received. As soon as we receive your confirmation we will release the payment to the seller. An inspection period of 2 days will be given to the buyer to inspect the item(s) shipped. You may require an additional of 3 days. The inspection period begins on the working day (Monday - Friday) after the goods have been received and continues for the number of working days set. The day the goods are received is established according to the consignment date indicated by the courier or the transport company. Safe Trading Tips - Buy with Confidence. If, for any reason, you are not satisfied with your purchase you can return the product within 30 days. As our User Agreement states, if you are an approved buyer on any product, you are expected to honor your approval in five business days. If you have a problem with the purchase of a vehicle, or want to make a claim please contact us. Copyright © 1995-2011 Google. All Rights Reserved. Designated trademarks and brands are the property of their respective owners. Use of this Web site constitutes acceptance of the Google User Agreement. I'm emailing you regarding the blue 2003 Chevy S-10 ZR2 pickup truck (4.3L V6 gas engine, 4x4 automatic) that I have for sale. I'm a PFC in the US Army and bought the truck while I was serving at the US Army Reserve Center in Orlando, FL. Truck is in very good condition as you can see from the pics. Miles are a little over 87k (87,176) and has never been smoked in! It is accident free with clear title in hand and I'm the 2nd owner. Has never been abused and is in great shape. It has automatic hubs and the 4X4 works flawlessly. Truck has been maintained regularly and does not leak any fluids, miss or smoke. I have never had any problems with the truck at all, its always kept clean and oil has been changed every 3500 miles. Price was reduced to $2,950.00 (not negotiable!) as I need to sell the truck before leaving with my platoon for Afghanistan. If you want to buy it please make sure that you have cash available, NO trades!! Please note that I want to be assured of both serious intentions to buy and availability of funds prior to securing the sale, therefore the whole deal will be handled through google checkout which will act as a power of attorney. This way both buyer and seller will be 100% covered during all the steps of this transaction. If you are seriously interested in this purchase please reply at your earliest convenience. Truck comes with a 2'' lift! Always well maintained. Ready to go anywhere. Have all service receipts since 2004! Interior is in excellent condition. Never smoked in! There is a small ding on the bed above the driver side wheel well that I've tried to get a picture of. Everything works as it should! Very nice truck!